El Ganzo Cabo is a unique, luxurious, boutique, beachfront hotel. Situated in picturesque La Playita, at the base of Puerto Los Cabos marina on an old fisherman’s wharf; guests can sit back and watch pelicans and other sea-life up close and personal, and observe the comings and goings of the many impressive yachts moored at the marina. El Ganzo balances the area’s natural beauty with modern delights, and is only a 20-minute drive to the SJD International airport or a 5 minute drive to the historic town of San José del Cabo and the famous Art Walk (every Thursday evening during the winter season). The 69-room member of ‘Preferred Lifestyle’ features 60 deluxe rooms, 3 master suites, 4 large suites, and 2 extra large suites. 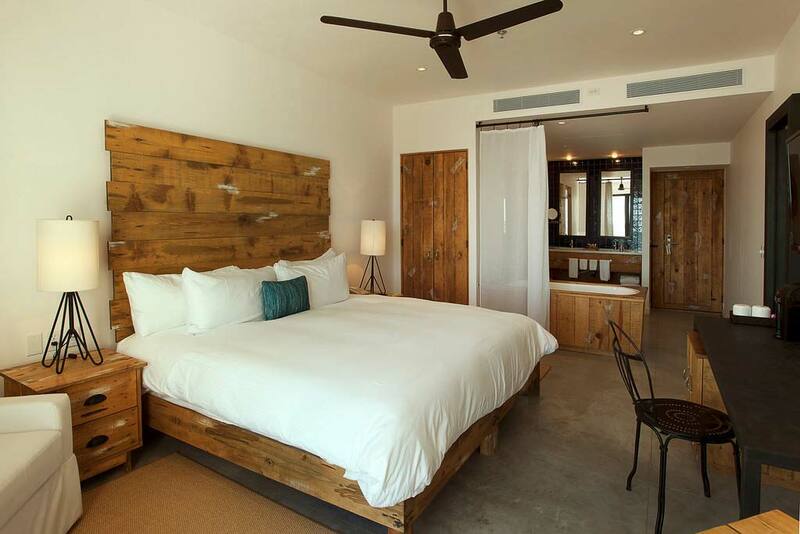 All guest rooms overlook the Sea of Cortez, and are luxuriously appointed with modern décor featuring rustic undertones in natural elements of stone, wood and glass throughout. A complimentary, fully stocked mini-bar, custom, indigenous bath and spa products, and wireless Internet access are among El Ganzo’s many amenities. El Ganzo is perfect for Artisans looking to escape and engage with brilliant people and artists from around the world. There is always something new to discover, as El Ganzo prides itself on their impressive and ever-expanding art collection, from both Mexican and International artists. This trendy hot spot is appeals to celebrities, artists, and musicians. So don’t be surprised, if you rub elbows with some interesting people in this beautiful boutique hotel. Room rates include accommodations only (European Plan), but there is great food and drink to be had in the Hotel’s restaurants and spectacular roofdeck with pool, overlooking the marina. In addition, some quaint and delightful nearby restaurants, provide authentic Mexican flavour, at very affordable prices. Just ask your LuxLife Concierge for restaurant recommendations to fit your style, appetite and budget. 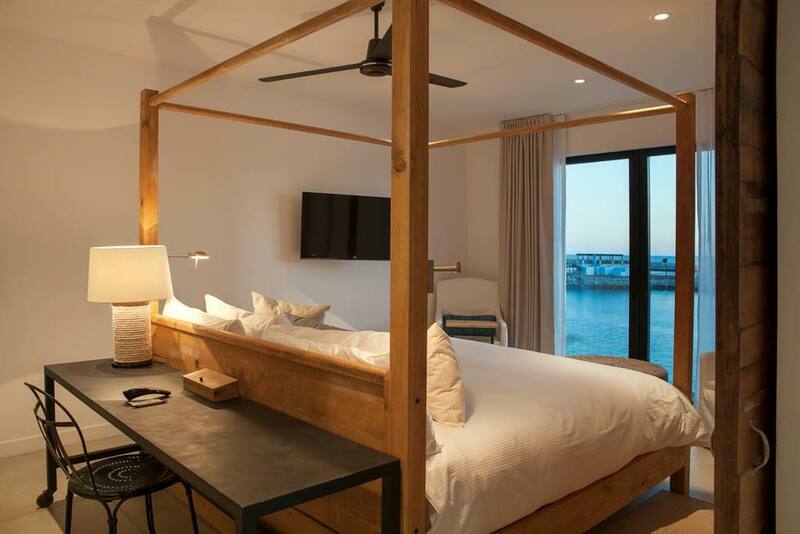 El Ganzo Hotel sits on a marina, but don’t fret — as your concierge water ferry can zip you across the marina to the El Ganzo Beach Club where you can enjoy great food, drinks, sand and sun at a very swimmable white sand beach. Clean lines and contemporary in design, these 380 sq ft rooms have Juliet-style sliding glass doors for taking in the clear ocean views. 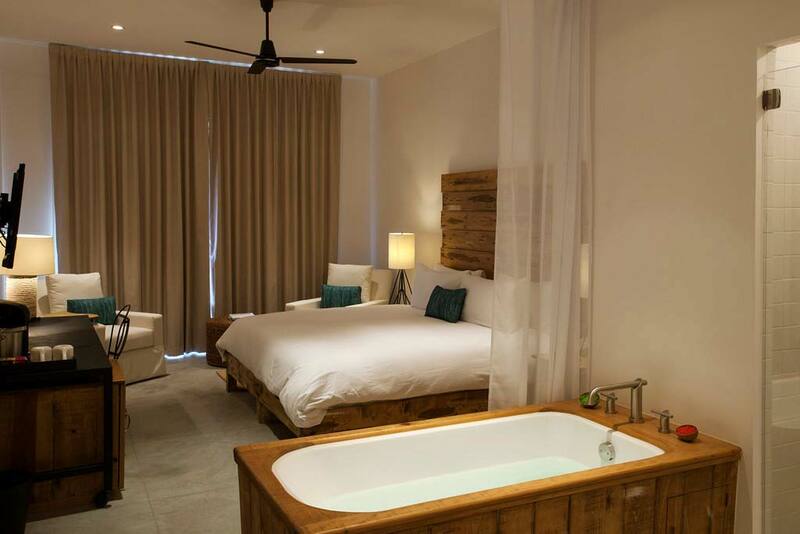 The king-size room comes with hand-hewn platform bed frame, slim metal writing desk and two armchairs. The glossy-white tiled bathroom with rustic wood accents has a shower, separate bath tub and locally made rosemary bath products. Amenities include a flatscreen smart TV, iPad (in-room directory), minibar, coffee making service and complimentary WiFi. Bask in the warm salty breezes on your private, ocean-facing Juliet-style balcony. These contemporary 380 sq ft rooms with rustic wooden furnishings and poured-concrete floors have a king-size canopy bed, slim metal writing desk and two armchairs. The glossy-white tiled bathroom has a shower, separate bath tub and locally made rosemary bath products. Amenities include a flatscreen smart TV, iPad (in-room directory), minibar, coffee making service and complimentary WiFi. Enjoy your private terrace with rocking chairs and day bed while gazing over the water of the Sea of Cortez. The Terrace Room with a king-size bed and rough-hewn wooden platform bed frame, are 380 sq ft and has a slim metal writing desk and two armchairs. The tiled bathroom has a shower, separate bath tub and locally made rosemary bath products. Amenities include a flatscreen smart TV, iPad (in-room directory), minibar, coffee making service and complimentary WiFi. Perched on the edge of the Puerto Los Cabos Marina on the Sea of Cortez, just a few minutes across the bridge to the quaint town of San Jose del Cabo with its array of casual and fine dining, El Centro square, and Historic Art District. El Ganzo is also close to many attractions in the growingly popular La Playita fishing village. Situated between San Jose’s famed Estuary, and Puerto Los Cabos, and minutes from world famous Flora Farms and Acre Organic farm to table restaurants. El Ganzo full service Spa at Puerto Los Cabos will pamper you, massage your kinks and worries away, and refresh and restore your natural beauty. Speak to the front desk to arrange treatment(s). Everyone is welcome at El Ganzo, including children. Extra person charges may apply if more than two people are sharing a room. Some conditions apply. Check out time is noon. Late check out available at extra charge. Airport shuttle available at extra cost. Free valet and self parking. Free wifi in rooms, free wifi available in some public areas.A complimentary, fully stocked mini-bar, custom, indigenous bath and spa products, and wireless Internet access are among El Ganzo’s many amenities. Los Cabos is proud to offer some of the most scenic and challenging golf courses in the world, designed by famed professional golf architects. El Ganzo is closest to the famed Puerto Los Cabos courses. Your hotel concierge or luxlifevacations.com can make all arrangements for you to hit the links at any of the course(s) of your choice. Cancellations: Cancellation must be received 7 days prior to arrival; otherwise 1 night penalty charge will apply.